The latest Chesterfield magistrates’ court results as published in the August 2 edition of the Derbyshire Times are listed below. Kevin Anthony Fanshaw, 36, of Green Farm Close, Holme Hall, Chesterfield. Indicated a guilty plea to possessing 20.59grammes of 5F-MDMB-PINACA, a controlled class B drug. Must pay a £20 victim surcharge and £85 costs. Discharged conditionally for 12 months. Lee Carl Woodger, 26, of Highfields, Ashford-in-the-Water, Bakewell. Admitted failing to comply with the supervision requirements imposed after release from imprisonment by failing to attend with the supervising officer. Committed to prison for 14 days. Craig Shaun Anthony Ball, 37, of Piper Avenue, Clay Cross. Admitted failing to comply with the supervision requirements imposed after release from prison by failing to attend with the supervising officer. Fined £60 and must pay a £30 victim surcharge and £60 costs. Troy Nigel David Keeling, 24, of Stubbing Road, Chesterfield. Admitted failing to comply with a community requirement of a suspended sentence order by failing to attend with the responsible officer. No adjudication. Suspended sentence imposed for assault varied to a prison term of 16 weeks suspended for 24 months with a Rehabilitation Activity Requirement and unpaid work requirement to continue. Must pay £60 costs. Antony Wayne Marriott, 26, of Derwent Drive, Tibshelf, Alfreton. Admitted failing to comply with the requirements of a community order by failing to attend with the responsible officer. Fined £50 and must pay £60 costs. James Michael Frederick Nash, 33, of Tapton View Road, Chesterfield. Admitted failing to comply with the supervision requirements imposed after release from imprisonment by failing to attend with the supervising officer. Order too continue and supervision default order made in that the defendant must comply with requirements before the end of September 2, 2018, including a curfew with electronic monitoring for six weeks. Must pay £60 costs. Daniel John Smith, 41, of Springfield Crescent, Bolsover. Admitted failing to comply with the requirements of a community order by failing to perform for the number of hours specified such work as was directed by the responsible officer and also failed to keep in touch with the responsible officer by failing to provide verification for the reasons for absence within five days. No adjudication. Must pay £60 costs. Dealt with for the original offence which was subject to the community order of stealing a vehicle. Community order to last until July 23, 2019, with 40 hours of unpaid work. Gavin William Woolley, 41, of Welbeck Close, Staveley. Found guilty of harassment in that he made numerous mobile phone calls and made threatening gestures in the street and at a court. Fined £180 and must pay a £30 victim surcharge and £250 costs. Restraining order to last until July 23, 2020. Ice Lee Walker, 18, of Bevan Drive, Chesterfield. Pleaded guilty to using threatening behaviour. Must pay £50 compensation, an £85 victim surcharge and £85 costs. Community order to last until July 24, 2019, with a Thinking Skills Programme and a Rehabilitation Activity Requirement and 100 hours of unpaid work. Anna Bunting, 21, of Duke Street, Creswell. Pleaded guilty to assault by beating. Must pay £50 compensation and an £85 victim surcharge. Pleaded guilty to damaging a Citroen C4. Must pay £50 compensation. Community order to last until July 24, 2019, with a three-month curfew with electronic monitoring and a Rehabilitation Activity Requirement. Aaron John Millar, 35, of Old Hall Road, Chesterfield. Indicated a guilty plea to assault by beating. Indicated a guilty plea to using or threatening unlawful violence. Must pay a £115 victim surcharge and £85 costs. Committed to prison for 12 weeks suspended 18 months with a Building Better Relationships programme and a Rehabilitation Activity Requirement. Restraining order to last until January 19, 2020. Peter David Gee, 48, of Hunloke Road, Holmewood, Chesterfield. Pleaded guilty to assaulting a police officer in the execution of his duty. Fined £200 and must pay £100 compensation, an £85 victim surcharge and £85 costs. Community order to last until January 22, 2019, with a Rehabilitation Activity Requirement. Andrew John Woods, 45, of Farm Lane, Eckington. Pleaded guilty to assault by beating. Must pay an £85 victim surcharge and £85 costs. Community order to last until July 22, 2019, with a Rehabilitation Activity Requirement. Isabelle Joy Hurcum, 56, of Hemming Green, Old Brampton, Chesterfield. Found guilty of two counts of assault by beating. Must pay an £85 victim surcharge and £620 costs. Community order to last until July 24, 2019, with a Rehabilitation Activity Requirement and 100 hours of unpaid work. Jonathan Gerrard, 35, of Mill Lane, Old Tupton, Chesterfield. Pleaded guilty to assault by beating. Must pay £150 compensation, an £85 victim surcharge and £85 costs. Community order to last until July 24, 2019, with 80 hours of unpaid work. Philip Jones, 50, of Kingsley Crescent, Stonebroom, Alfreton. Pleaded guilty to failing to provide a specimen or specimens of breath in the course of an investigation into whether he had committed an offence when suspected of having driven a vehicle. Must pay an £85 victim surcharge and £85 costs. Community order to last until July 22, 2019, with 80 hours of unpaid work. Disqualified from driving for 18 months. Daniel James Townsend, 34, of Pottery Lane East, Chesterfield. Pleaded guilty to exceeding the alcohol drink-drive limit. Must pay a £115 victim surcharge and £85 costs. Disqualified from driving 42 months. Committed to prison for 16 weeks suspended for 12 months with an Alcohol Treatment Requirement and a Rehabilitation Activity Requirement. Bradley Andrew Revell, 22, of Hagg Hill, New Tupton, Derbyshire. Found guilty of being the driver of a vehicle owing to the presence of which an accident occurred whereby damage was caused to another vehicle and failed to report the accident to police. No separate penalty. Found guilty of failing to stop after the accident. No totting disqualification after it was felt this would lead to exceptional hardship because the defendant needs to drive to retain his employment and this would impact on his father’s business and employees. Fined £600 and must pay a £60 victim surcharge and £620 costs. Driving record endorsed with six points. Found guilty of driving without due care and attention. No separate penalty. Andrew Ferguson, 38, of no fixed abode. Pleaded guilty to stealing razor blades belonging to Wilkinson’s store, on Institute Lane, Alfreton. Indicated a guilty plea to stealing a pedal cycle. Must pay £500 compensation. Committed to prison for 24 weeks. 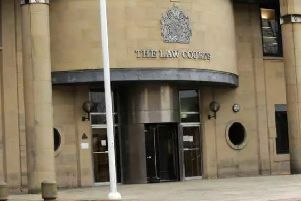 Ashley Mellor, 28, of Allendale Road, Wingerworth, Chesterfield. Indicated a guilty plea to stealing razor blades valued at £92. Must pay £92 compensation, an £85 victim surcharge and £85 costs. Indicated a guilty plea to stealing skincare goods valued at £151. Must pay £151 compensation. Indicated a guilty plea to stealing skincare products valued at £127. Must pay £127 compensation. Indicated a guilty plea to stealing razor blades valued at £100. Must pay £27 compensation. Indicated a guilty plea to stealing skincare goods valued at £125. Community order to last until December 10, 2018, with a 16 week curfew with electronic monitoring. Admitted failing to surrender to custody at Chesterfield magistrates’ court having been released on bail. To be detained in the court house and detention deemed served by time already spent in custody.